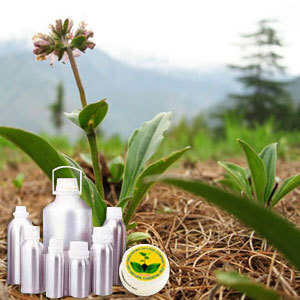 This Wildcrafted Oil is extracted from Nardostachys jatamansi of the Valerianaceae family. Also known as "false" Indian valerian root, it is a tender aromatic herb with pungent rhizome root that found its origin to the mountainous regions of northern India, China and Japan. The oil has a warm, misty, heavy aroma and is pale yellow in color with medium in viscosity. It contains bornyl acetate, valeranone, jonon, tetramenthyloxatricylodecanol, menthylthymyl-ether and 1,8-cineol. A base note with a strong aroma, Spikenard Essential Oil has a harsh, earthy, woody smell that is slightly musty. This oil can mix well with Lavender, Lemon, Clary sage, Neroli, Patchouli and Vetiver. This Wildcrafted Oil is known for its therapeutic properties and is anti-inflammatory, anti-pyretic, antiseptic, laxative and tonic. It has some rejuvenating qualities especially for the mature skin and can also be beneficial for tension, stress, migraine, nervous indigestion and insomnia.